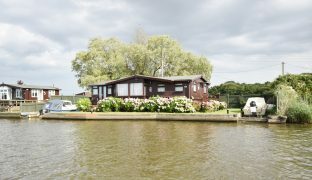 A substantial and spacious riverside bungalow with 3 bedrooms, over 75ft of private river frontage, mooring dock, slipway and stunning views front and back. 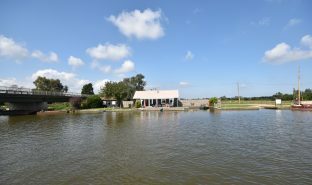 The property also has two timber sheds, and backs onto picturesque farmland to the rear. 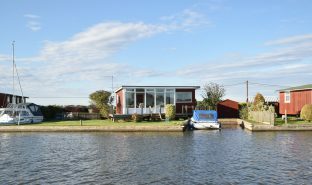 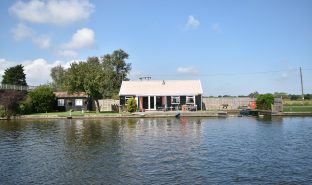 A spacious detached riverside bungalow with over 75ft of private river frontage directly onto the River Thurne, with mooring dock, slipway and stunning views front and back. 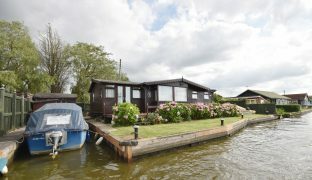 This substantial waterside property offers accommodation that consists of an entrance lobby, a well fitted dual aspect kitchen, living room with feature box bay window to the front aspect looking out over the river, dining room with patio doors out onto the raised deck, three bedrooms and a shower room. 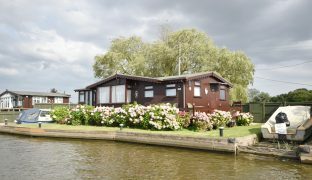 Features include full UPVC sealed unit double glazing, private 26ft long mooring dock, separate slipway and 77ft of quay headed river frontage. 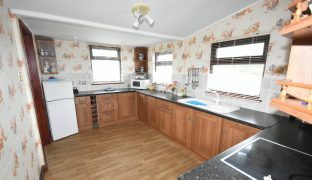 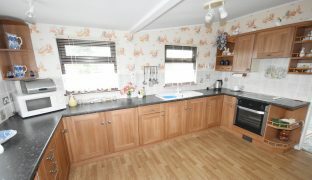 Entrance Hall: 13’1″ x 8’8″ – Extensive range of wall and floor mounted units with sink unit and drainer, with built in oven, hob and extractor fan. 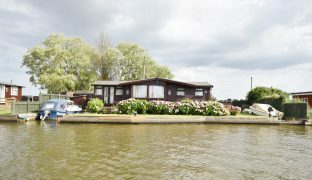 Window to front and side with impressive river views. 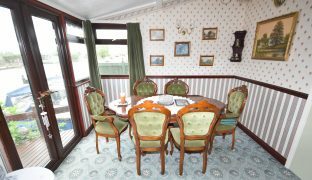 Dining Room: 10’3″ x 9’11” – Dual aspect with window to side aspect and French doors to front aspect with river views. 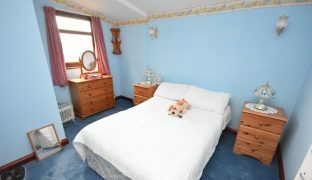 Wall mounted heater. 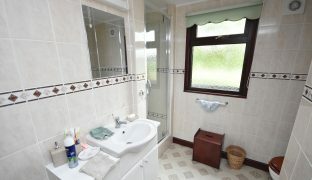 Bedroom 1: 12’1″ x 9’0″ – Window to rear, views over open farmland, wall lights. 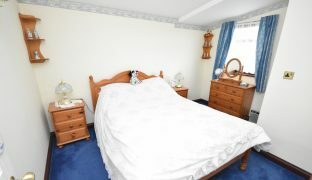 Bedroom 2: 12’0″ x 9’0″ – Window to rear with views over open farmland. 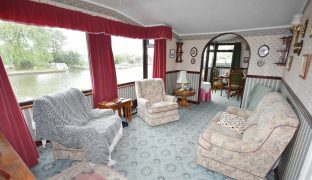 Bedroom 3: 9’11” 6’1″ – Window to side with river views. 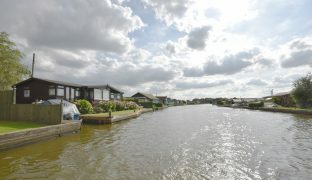 The property benefits from 77ft of private quay headed river frontage with impressive panoramic views. 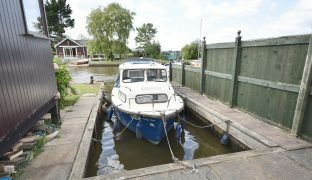 There is a mooring dock that measures 26’0″ x 9’6″ and a separate slipway. 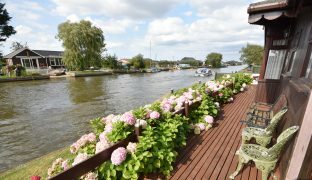 The garden is laid to lawn with an impressive selection of pink hydrangeas set against the raised deck which scans the full length of the property, offering the perfect vantage point to enjoy the beautiful river views. 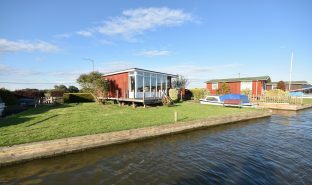 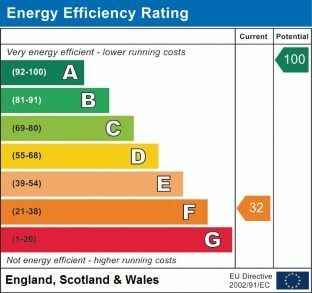 The property also offers two timber sheds, outside lighting and is enclosed to the rear by fencing and a secure gate. 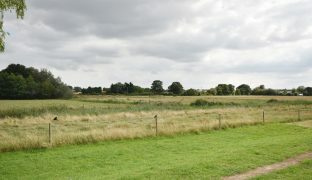 The property also backs onto picturesque open farmland. 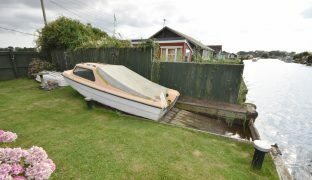 Access is by footpath and river only.